Water fluoridation is known to cause Dental Fluorosis. 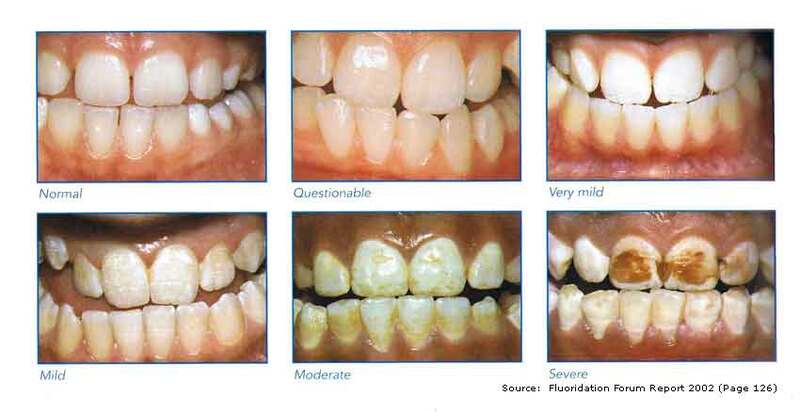 Dental fluorosis is tooth enamel damage for life. The Department of Health & Children published pictures of dental fluorosis in the Forum on Fluoridation Ireland 2002 Report. Dental fluorosis is irreversible damage to children's teeth. This damage was known to be a high risk by promoters of water fluoridation from the start, and no one told the children. The children and their families had a right to say NO to this damage, a right which has been denied to them since 1963. We believe mandatory water fluoridation is an unreasonable health risk to our children and it is unconscionable to deny them their right to say no. Apart from dental fluorosis from over exposure to toxic fluorides in water fluoridation, many world wide reputable studies show, that there are other serious health complications in communities exposed to water fluoridation. Vulnerable groups like kidney patients, people with low thyroid function, and the elderly, and babies, who are fed formula made with fluoridated water, must not be exposed to toxic fluorides in their drinking water. Ending fluoridation will stop exposure to toxic fluorides from this source. Check the websites on our Home Page for detailed current studies on these health issues. The ADA (American Dental Association) on 9th November 2006 sent an eGram called 'Interim Guidance on Reconstituted Infant Formula'. In this eGram it was stated "research was cited that raised the possibility that infants could receive a greater than optimal amount of fluoride from reconstituted baby formula. If using a product that needs to be reconsituted, parents and caregivers should consider using water that has no or low levels of fluoride." Irish parents and caregivers need to know this too.